This stamp is called COFFEE and it is a coffee grinder with a coffee urn and cups. 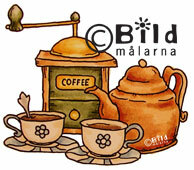 This stamp image matches the new Bildmalarna Picnic Collection Scrapbook Patterned Paper also called Coffee. This measures approx. 1 3/4" tall x 2 1/8" wide.